start learning something new here: IPS officer send 1000rs cheque and thank you note to Dhoni for losing match..!! 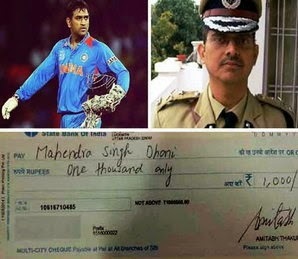 IPS officer send 1000rs cheque and thank you note to Dhoni for losing match..!! Lucknow: Indian Cricket Team has been aggressively criticised after losing to Australia in the ICC World Cup 2015 semi-final which was held in Sydney Cricket ground on March 26. Some people even crushed their television sets after kangaroos beat Indian by 95 runs. On the other hand, IG of Uttar Pradesh, Amitabh Thakur sent a cheque for Rs. 1000 to Indian captain Mahendra Singh Dhoni as a present. He claims that as India lost the semi-final, people will not be interested in watching the final match between Australia and New Zealand which in turn will save their time. He has also written a letter to Dhoni. IG Civil Defence IPS officer Amitabh Thakur sent the cheque worth Rs. 1000 at his Ranchi located home on Friday. He said that on Friday, several government employees left their official work and were busy watching the match which is not in the favour of the country. After losing the match, the team will is not left with any place in the World Cup and have returned home. Thus, people will not be interested in watching the final match as India did not qualify for it. He has sent Dhoni the cheque as a 'thank you' present. In the letter addressed to captain Ms Dhoni, officer Amitabh Thakur wrote, "You are a celebrity and have your grip on other players of the team. Thus, you should appeal people working in government and private sectors to not leave their work for the Cricket match as it hampers the development of the country." He further mentioned "This society is as much yours as it belongs to the cricket fans that populate it. So it is your societal duty to not allow people to suspend government, financial and personal work in order to watch cricket matches." While we await Dhoni's response to the letter, people can still watch Australia Vs New Zealand since it is on Sunday.